Architectural objects confront their environment. They constitute a boundary, a form with an internalized point of view. Understanding architecture as environmental objects suggest a questioning of these dichotomies of separation between the symbolic landmark and the landscape background. It represents an architecture that amplifies nature, attunes to it and makes us aware of it. 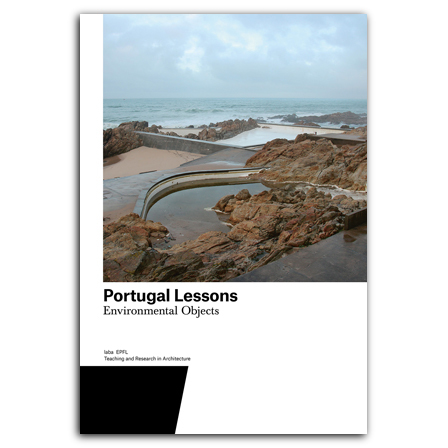 Portugal Lessons: Imagining Architecture as Environmental Object takes Portugal as case study for such contextualism going beyond and understanding of design as immunization. Based on the latest research program conducted by EPFL’s Laboratory Basel (laba), it explores the topic of this architectural boundary: with whom we live with, to whom we open our house, how permeable the boundary should be. The findings are visualized in striking images, graphics and maps. The book also features proposals for architectural interventions by laba’s students, all of them tackling issues of housing. ist Architekt und arbeitet als Teaching Assistant am laba. ist Architekt und seit 2005 Professor an der Architekturabteilung der Ecole polytéchnique fédérale de Lausanne (EPFL). Er leitet das EPFL-Studio Laboratoire Bâle (laba). ist Architekt und al Teaching Assistant am laba tätig. ist Architektin und als Research Assistant am laba engagiert. Sie hat an der EPFL studiert.